On September 11, 2001, I was at work at Universal Studios. I would often get in quite early to catch up on paperwork. I had CNN on, as usual, and happened to be looking at the screen when the report came on about the World Trade Center. I remember sitting there, seemingly paralyzed, unable to believe what I was seeing. I called home and told them to turn on CNN. After I watched the second jet hit, I called home and told them we were under attack. They thought I was crazy. They didn't think that for long. What I wrote that week, as an editorial for Worldly Remains, are words that I stand by today. With the growing hatred here at home, between citizens of this country - neighbors and friends, threatening each other - I felt the great need to state these thoughts again. I was born at St. Vincent's Hospital in Greenwich Village, New York. I was raised in New Jersey and have spent more than a little time living and working and playing in Manhattan. 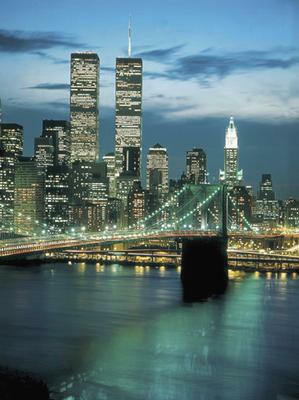 There are no words to describe my feelings on the morning of September 11, 2001. Horror, shock, rage—these are totally inadequate, but they are all we have. It's Friday now and I still haven't wrapped my mind around the situation, but I'm getting there. I am so damned proud of the people of New York. Look at them out there—breaking their hearts and risking their lives in the hopes of finding just one person still alive—flooding downtown, asking where to go to be of the most help. Stubborn bastards—those are my people. Taking care of this without any questions so they can get back to the serious business of bickering with fellow New Yorkers as soon as possible. I have never known people to argue more that they do in New York City. God how we love to bicker! But there's no bickering now. And Mayor Giuliani, I'd say you've finally proven yourself worthy of the title "The Honorable." I never thought I'd see the day when I would say that! I have been told that this magazine is profane because we do not censor our writers. We permit them to use all the words available to them in our limited language. These are descriptives, nothing more. Ron often quotes Mark Twain's "use the right word, not its second cousin." This country guarantees freedom of the press. If some feel these words are profane, so be it, but I don't view language that way and will continue to use it as I see fit. Two commercial jetliners piloted by suicidal fanatics filled with innocent travelers, tearing through the walls of the World Trade Center's twin towers and scattering debris and humanity to Brooklyn is profane. Still, I can't sanction the idea of full-scale war. By the time this column sees print, the die may already be cast. For now however, I hold the thought that when Bush says "a different kind of war" he means a precision strike against the person responsible and those who funded him. I'm not unaware that this action must be answered, but the awesome might of the American military machine in high gear—while understandably roused—is capable of showing brains as well as brawn. Let the brains prevail. Make no mistake, I know more blood will be shed, but we can't let it be innocent blood. And that's what we'll get if we go all out, and this too would be profane. George Walker Bush is the man who's going to see to this. Thus far he has not gone off half-cocked, and I applaud his caution. I hesitate to use the word, but I "pray" he is guided by what my sister-in-law Mary Lee refers to as a "higher power, something bigger that you or me." If there be such a thing, let it raise its hand and point our leaders in a direction that will permit us, as a nation, to hold our heads high—as high as they rightfully hold them in New York City. Let us refrain from personal attacks on fellow citizens because of their ethnicity. Let us find the real culprit and deal with him. Let us not turn on each other now, when the only way through and past this is to stand side by side. Waving flags is all very fine, but when the shouting is done, I don't want to have to skulk in the shadows and apologize for my birthright. I want to proudly state, "I am an American." Don't you?